Ever end up buying a 10 lbs bag of potatoes when you only wanted 2 or 3 of them because it was only a dollar more? We have, and I had to think quick of how to start preparing these potatoes. So I thought of 3 ways to try and use up some of these potatoes during the week. 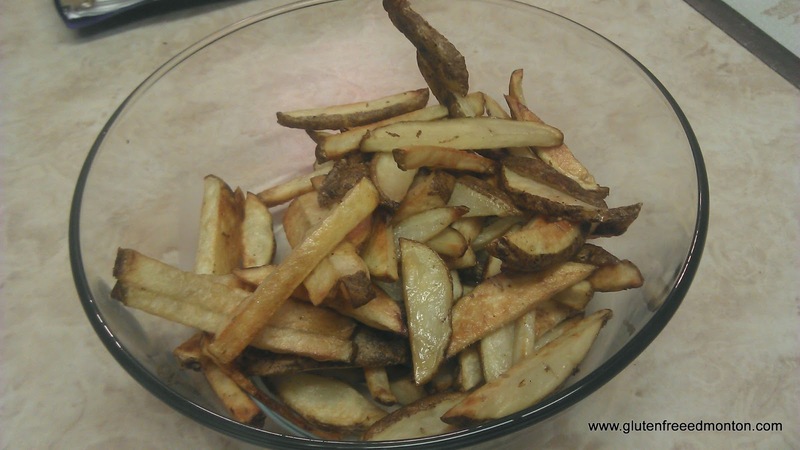 Make your own fries as a side! I know most frozen fries are just potato and salt, but there is nothing like making your own french. I baked mine. I cut them into thin slices, tossed them in vegetable oil, season with salt and put them in the oven for 20 minutes flipping half way. Make a hash for breakfast! Dice up the potatoes really small. Heat up some oil on sauce pan and start to brown. Chop up some onion and add to pan. Add some some chopped up sausage, or bacon or any type of fatty meat you have around. Make a Sheperds Pie! Try out this gluten free shepherds pie recipe. It will be sure to use up some of those potatoes during the week. Use these three dishes in a week, and you will be sure to make a dent to that sack of potatoes. Ringing in the New Year! Hello 2013! What 2012 meant to Gluten Free Edmonton!